When the iPhone App Store launched last year, a flood of ‘virtual’ music apps, ranging from pianos to drums hit the market. Most of these didn’t fare so well on the iPhone’s small screen, save for one fantastic standout: Smule’s Ocarina, which was perfectly suited for the iPhone and was fairly easy for beginners to pick up. The app became a massive success, and became one of the App Store’s most popular applications ever. Today, Smule has released Leaf Trombone: World Stage, a new virtual musical instrument that is better than Ocarina in nearly every way. 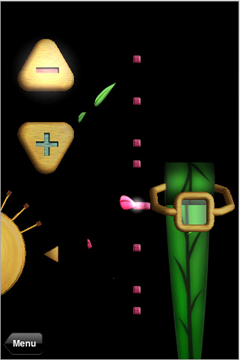 One of the biggest issues newbies had with Ocarina was that there was no musical instruction built in – users would have to visit Smule’s website, where they could download ‘tabs’ of their favorite songs. Without the tabs, playing familiar tunes became an exercise in frustration, and I suspect many users never made it to the website and simply tried to do the best they could on their own. Leaf Trombone solves this issue with a built-in tutorial mode that shows players where they should place their fingers (it also has a nice backing track to make you sound ever better). Using an integrated browser, users can sort through lessons created by other users, which range from classic songs like ‘Canon in D’ to more contemporary fare like the Super Mario Bros. theme song. This feature alone will make the app much more accessible (and addictive) than Ocarina was. The app’s ‘World Stage’ isn’t just for show, either. While Ocarina had some degree of community built-in (you could listen in in real time as other Ocarina players played songs), there wasn’t really any way to interact with them. Leaf Trombone invites users to judge their peers as they play, allowing them to display emoticons and send comments in real time. Leaf Trombone enables this kind of real-time interaction by using Smule’s innovative audio broadcasting technology, which can recreate the subtle nuances of the player’s breath control without having to stream massive music files. 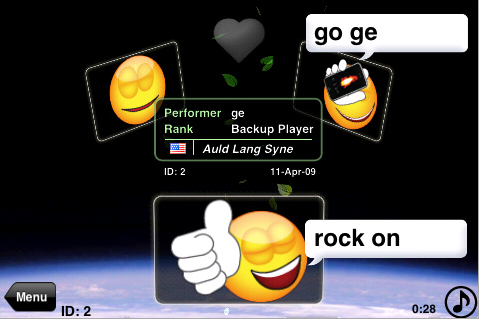 Other features, like a built-in achievement system (think Rock Band) allow users to get awarded when they complete specific tasks, adding another layer of depth to the app. I like Leaf Trombone a lot – it taps into the iPhone’s network effect, it’s fun to play, and anyone can get started with a minimal amount of effort. But I have one major concern: you’re playing a trombone. Not to insult all of the trombonists out there, but the instrument is not especially soothing to the ears. Unlike the Ocarina, which is surrounded in mystique and has a tranquil, soothing sound, the trombone is a bit more… abrasive. That said, the application more than makes up for this, and if it becomes an issue Smule can almost certainly just update the app with a new set of sounds.